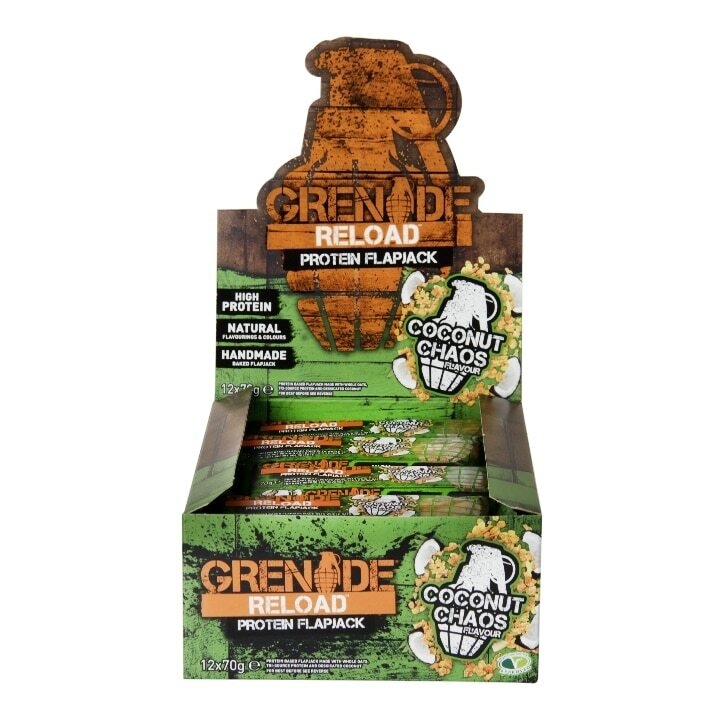 Grenade Reload Protein Flapjacks are a convenient way to eat extra high quality protein on the go, between meals or to support a demanding macro and calorie demand. Ideal for athletes or military personnel, to use after training, between meals or whilst on deployment. No need to add unwanted refined sugars or saturated fats to your diet. Keep on top of your macros with quality ingredients from Grenade. We know what you need. Each bar is 70g. Grenade Reload Flapjack Coconut Chaos is rated 5.0 out of 5 by 4. Rated 5 out of 5 by pb8331 from great quality A very tasty bar and a great snack to give you that extra protein and carbs I eat mine mid afternoon after training very filling as well. Rated 5 out of 5 by Jaymz from Gorgeous I love the coconut taste, I love the texture, I love everything about it, it filled me up and gave me the energy I needed!